Christian, are you a saint or a sinner? Some of you may be asking what in the world that means? Don’t worry. I asked that too when I first heard it. That is, while a Christian is legally declared to be righteous in the sight of God on the basis of Christ’s perfect work, they will continue to commit sin in this life. Until we are glorified, Christians are both saint and sinner. That’s why Paul could decalre the glorious truth that Christians are “a new creation” (2 Cor. 5:17) and yet near the close of his ministry still speak of himself as the chief of all sinners (1 Tim. 1:15). Historically it mattered as this goes right to heart of how a person is justified; is righteousness imputed or infused. You can read a little more about that here. But why should this matter for evangelical Christians who affirm that we are justified by faith alone, in the finished work of Christ alone? Because being aware that we are at the same time saint and sinner keeps us humble and consciously dependant upon God’s grace. Bridges is right. But I see another possible route too. Yes, a person who fails to see the paradox of the Christian life is likely to end up blind to their sin and embrace a form of self-righteousness, but they may also tragically break down in a state of spiritual depression when the presence of sin in their life becomes apparent despite their best efforts. Both routes put the gospel on the shelf and focus the individual on themselves and not Christ. 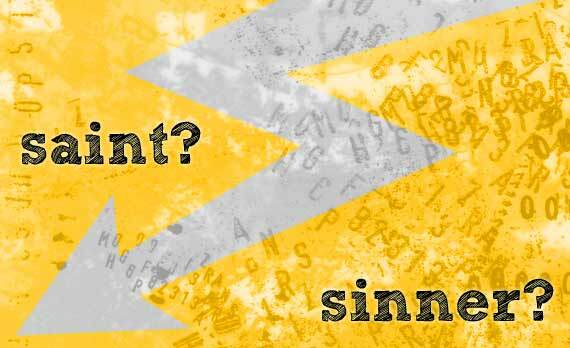 As Christians we firstly need to acknowledge that we do have personal sin (1 John 1:8). Then as we remember our sin, repent and make much of Christ and the gospel. Not even our tears of repentance are without the stain of sin! I’m most certainly Simul Iustus et Peccator. Are you?